With the NCAA tournament and WNBA just wrapping up, there’s been a great deal of talk about the dominance of the UConn Lady Huskies. Trust me, I’m the first to admit that that talk has been well-earned, but the Lady Huskies aren’t the only GladiatHers who have been in the practice of dominating their competition. I decided that today is as good a day as any to talk about another GladiatHer with a knack for winning. Standing at a whopping 4’9”, the GladiatHer I’m talking about is considerably shorter than all of the members of the Championship winning Lady Huskies; but what she lacks in height she’s made up for in strength, power, agility and heart. She goes by the name of Simone Biles and she truly is a dominating force to be reckoned with. In her 19 years on this earth Biles has done some pretty incredible things. For instance, she’s won the all-around competition in the US National and World Championships three times…in a row…back-to-back-to-back. That’s right, since 2013, Biles has single-handedly owned the American and international gymnastics world. But that’s just a snapshot of her winning streak. Since claiming the World Championship in 2013 Biles has won 11 straight all-around competitions. Eleven. Straight. That means that every time she stepped in the gym over the past 3 years, she’s been the best gymnast there. No other gymnast comes even close to having a winning streak last that long. She truly is amazing. Typically, the sports world really only starts to get excited about gymnastics right before the Olympics. The talk starts around July and tappers off around September. What Biles has done and is doing; however, is worthy of discussion well before anyone gets to Rio. You should be watching or at least keeping up with her historic run right now. So to get you up to speed on who Biles is and why you should be paying attention, I’m dropping 10 quick facts (in addition to the ones above) about Biles. 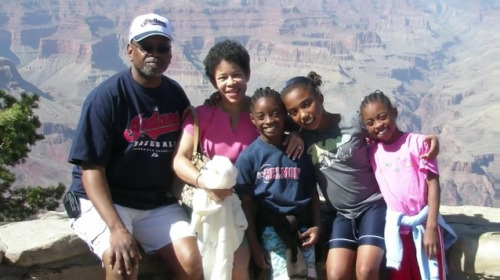 Biles and her sister were raised by her grandparents. Unfortunately, her mom struggled with drug addiction and could not properly care for the pair. Thankfully, her grandparents stepped up to the plate to adopt and raise the sisters. 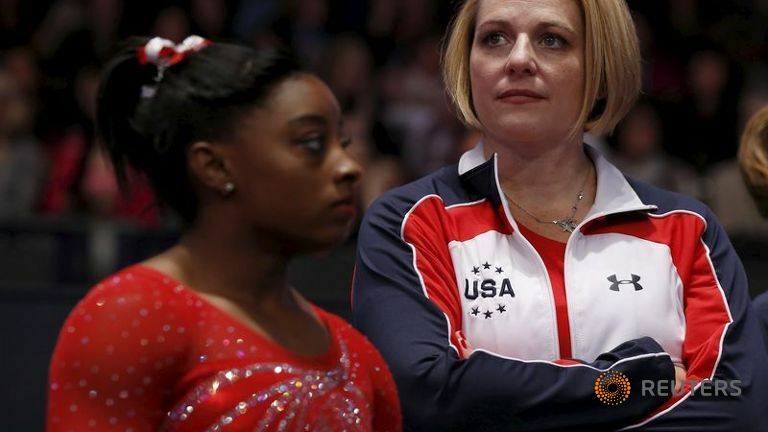 Biles has had only one coach, Aimee Boorman, throughout her entire amateur and professional career. At the age of 6, Biles took a field trip to a gym and the energetic kid caught Boorman’s eye. They’ve been rocking (or should I say tumbling) together ever since. Biles trains like a beast and pretty much always has. As a kid, Biles was home-schooled, so that she could manage to get 16 hours of flipping, jumping, balancing and flexing in per week. Now that pesky high school is out of the way, Biles trains about 30 hours per week. Biles is already planning for her future. Once gymnastics is done, she plans to have a career as a nurse, just like her grandmother. 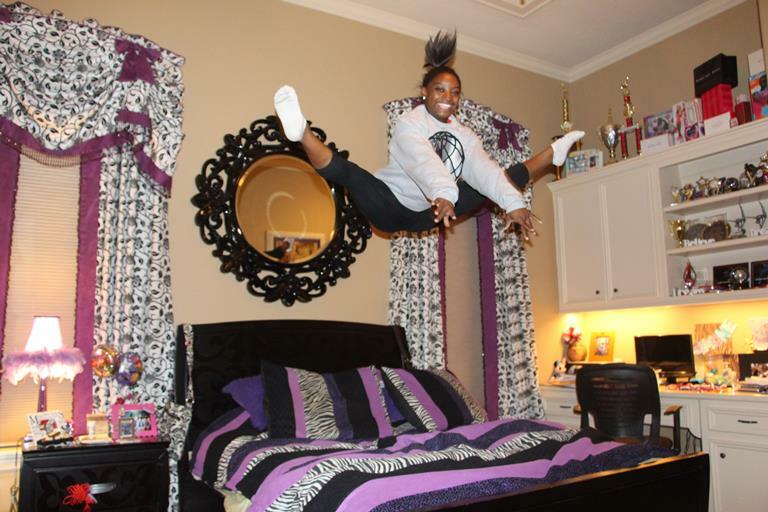 While basketball players have their signature shoes, Biles has a signature flip aaaand it’s pretty dope. “The Biles” is a double layout with a half twist. Don’t know what that looks like? I’ve got you covered. 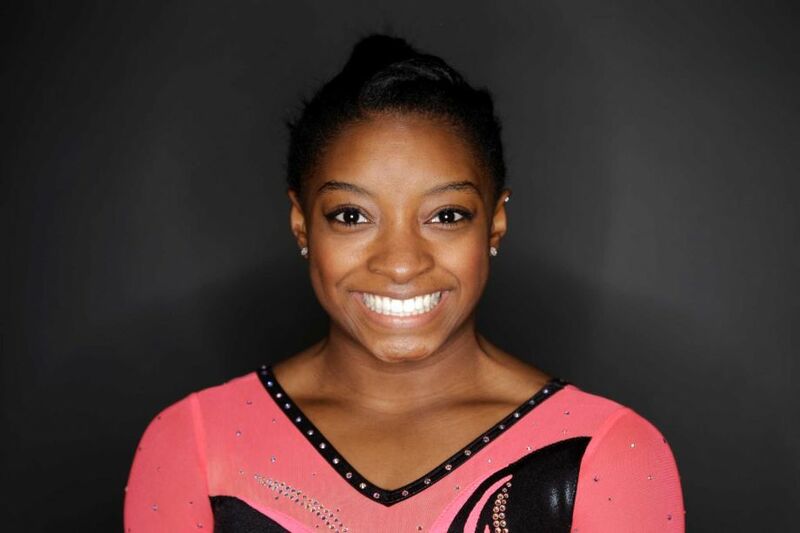 Biles’ 2013 World Championship made her the first woman of color to win an all-around world title. 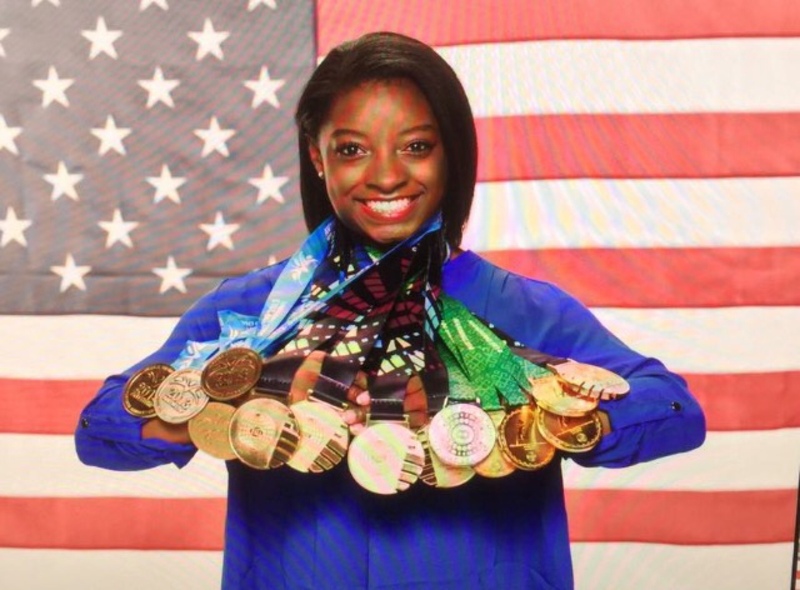 Biles has more gold medals than any other gymnast in history. Like other athletes of African descent, Biles has been the subject of racist commentary. A salty, old Italian gymnast didn’t want to give Biles her props for winning the 2013 World Championships. Rather than salute greatness she suggested that the only reason Biles won was because of her skin color. Rather than give the negativity any of her spotlight, Biles handled it like a boss and 110% ignored the salty Italian. 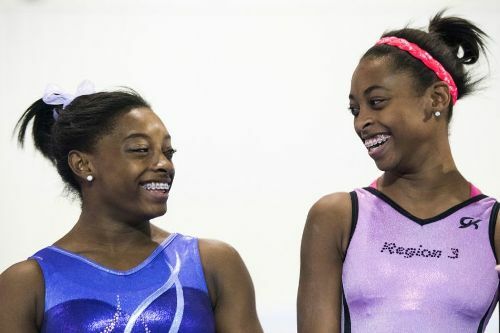 After Biles bossed up and won the World Championship in 2013, her grandparents bossed up and opened up a gym for Biles and others to train in. It really doesn’t get any more supportive than that. 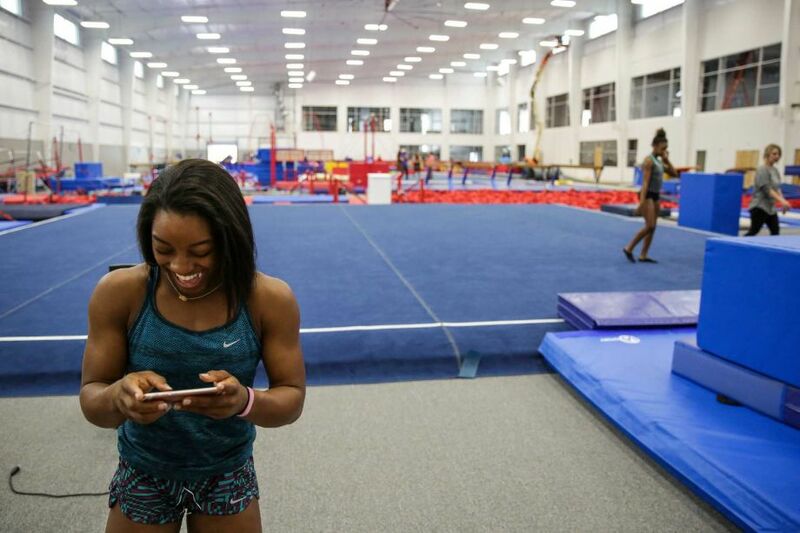 To help keep herself focused, Biles constantly updates her list of personal and professional goals. There’s one big professional goal that Biles has yet been given the opportunity to achieve, Olympic gold. Biles is determined to shake nerves and outside expectations to claim the gold medal in Rio. Congratulations. With those bits of information, you can probably talk circles around the Average Joe or Josephina. But I really encourage you not to stop here. Keep an eye this spring and summer for Biles. Follow her on her quest to do the unprecedented. She deserves your attention and support and I promise you’ll be thoroughly entertained. So did I convince you to watch gymnastics a little earlier this year?! Let us know what you think of Biles and whether you’ll be watching. GladiatHers.com will certainly be tuning in. Be sure to follow us on Twitter, Instagram and Facebook.